As the hoopla surrounding Bobby Hull’s record-setting 51st goal subsides, attention now turns to the National Hockey League standings and the race for first place. After the smoke cleared from six games on the weekend, the Montreal Canadiens are perched atop the NHL leader board. Saturday’s games saw Chicago down New York 4-2 in the game Hull got his record-breaker, Toronto blanked Boston 4-0 and Montreal got by Detroit 4-1. On Sunday, Chicago hammered Toronto 5-1, New York edged Montreal 2-1 while Detroit doubled Boston 8-4. Montreal split their weekend games, but that was enough to keep them in first place. They now lead the Black Hawks by one point. 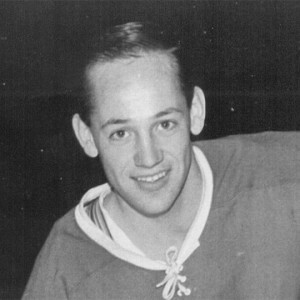 Jim Roberts scored twice in 48 seconds to power the Habs past Detroit on Saturday. Gilles Tremblay and Claude Provost scored the other Montreal goals in the 4-1 win. Norm Ullman replied for Detroit. Sunday evening, the Rangers rebounded from their 4-2 loss on Saturday to nip Montreal 3-2 at Madison Square Garden. Cesare Maniago, who surrendered Hull’s record goal on Saturday, was the star for New York against the Habs. Maniago made 38 saves, including 19 in a wild second period dominated by Montreal. At the end of the game, New York fans chanted “Hail Cesare” in tribute to Maniago’s performance. He now has given up only eight goals in his last six games. Montreal’s goals were scored by John Ferguson and Bobby Rousseau during that second period onslaught. Jean Ratelle, Bob Nevin and Don Marshall had the Ranger markers. 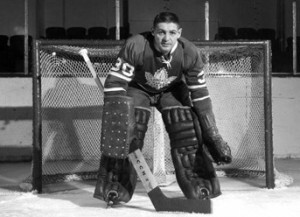 Toronto goalie Bruce Gamble earned his fourth shutout in seven games for the Maple Leafs. He had been with the team on emergency recall from Tulsa of the Central Professional Hockey League, but general manager-coach Punch Imlach made the recall official yesterday. Gamble will stay with the Leafs for the balance of the season. 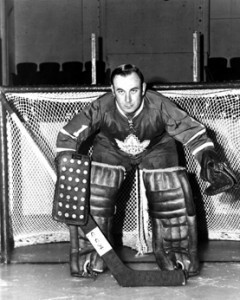 Toronto will carry three goaltenders, now that Johnny Bower and Terry Sawchuk are healthy and ready to play. 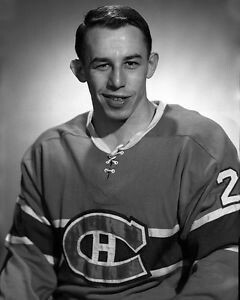 Imlach said that despite a 5-1 loss to Chicago last night, Gamble will be in goal against the Montreal Canadiens Wednesday. Imlach says the man they call “Paladin” or “Smiley Burnett” deserves his spot in the NHL. “Gamble was the only good thing we had out there. He was terrific. 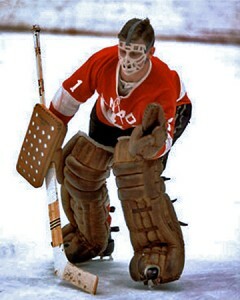 Terry Sawchuk – not going anywhere. Imlach also said that speculation that Terry Sawchuk would be dispatched to Tulsa to play himself into shape was incorrect. Sawchuk will stay with the Leafs. Just as the Leafs get all their goalkeepers healthy, the injury bug bites them in another area. Defenseman Allan Stanley, playing some of the best hockey of his career this year, takes Terry Sawchuk’s place in the Toronto sick bay. “I was in front of our goal and the play was on Bobby Baun’s side to the corner when someone hit the back of my leg. I went down and it was sore. Then the puck came out and I’d have got killed if I stayed down so I got up and iced the puck first chance I got. Andy Bathgate ended the worst scoring slump any NHL forward has seen in years last night. He did it in a big way, scoring two goals as the Detroit Red Wings blasted the Boston Bruins 8-4. Boston’s Ron Stewart reached a milestone in the same game. He scored his 200th career goal. The win for Detroit clinched a playoff spot for a team that has slumped badly in the second half of the season. 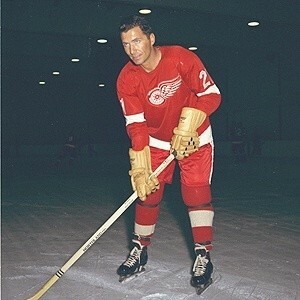 Alex Delvecchio also scored two goals for the Red Wings. Singles came from Val Fonteyne, Parker MacDonald, Dean Prentice and Floyd Smith. 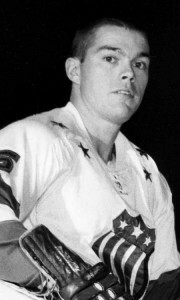 Besides Stewart, Boston also got goals from John McKenzie, who had two, and Ron Schock. To no one’s surprise, Russia won the sham that is the World Hockey Championships yesterday with a 7-1 trouncing of Czechoslovakia. Canada defeated Sweden 4-2 to claim third place. The Canadians did well to finish third. Trailing 1-0 after the first period, Canada scored three times in the second period to win going away. Nils Nilsson had given the Swedes the early lead. Gary Begg, Roger Bourbonnais and Marshall Johnston found the range in the middle stanza. Swede narrowed the lead to 3-2 on Lars-Goran Nilsson’s goal. Canada added insurance just past the half-way mark of the third when Fran Huck made a great play to set up playing-coach Jackie McLeod for Canada’s fourth goal. Canada’s veteran goalie Seth Martin was officially named the tournament’s outstanding netminder by the International Ice Hockey Federation directorate. The IIHF also picks an outstanding forward and defenseman and both of those awards went to Russians. Alexandr Ragulin was named top defender while Konstantin Loktev was best up front. Members of the press at the tournament polled the seven coaches for an unofficial all-star team. Martin was picked as the goaltender by unanimous vote of that group. Other Canadians picked by the coaches were Gary Begg on defence and Fran Huck at centre. Ragulin was named the other defenseman, while countrymen Loktev and Veniamin Alecksandrov were the other forwards picked by the bench bosses. It had to come. What can you say, except to congratulate him. Richard scored his 50 goals in only 50 games in the 1944-45 season. The record was equalled by Bernie (Boom Boom) Geoffrion of Montreal in the 1960-61 season. Hull also tied the record a year later. Down two games to none, the Toronto Marlboros pulled off two upsets to even their playoff series against the Peterborough Petes this weekend. Toronto defeated Peterborough by scores of 6-1 and 7-1. Both games were played at Maple Leaf Gardens. A major factor in the Toronto wins was the absence of Petes forward Danny Grant. Grant is suffering from a back injury and missed both games. With Grant out of the contests, the Marlies were able to defend against the other two-thirds of Peterborough’s top line, Andre Lacroix and Mickey Redmond. Saturday’s game saw six players share in the Toronto scoring. Jim McKenny, Brad Park, Al Osborne, Mike Byers, Terry Caffery and Tom Cassidy had the goals. Redmond spoiled Al Smith’s shutout bid. Mike Corrigan led the way for Toronto on Sunday with three goals. Others were scored by Wayne Carleton, Doug Dunville, Jim McKenny and Mike Byers. Drake Jopling had the only Petes goal in that game. In the Montreal-Hamilton series, the Baby Habs took a 3-2 win over the Red Wings on Saturday before the teams skated to a 4-4 tie yesterday. Montreal now leads that series 1-0 with two games tied. Oshawa and St. Catharines split a pair of weekend games. The Generals whipped the Hawks 5-0 on Saturday, with the Black Hawks bouncing back for a 6-3 win last night. That series is now tied 2-2. In the other series, Kitchener Rangers took a 2-1 lead over Niagara Falls with a 5-0 win over the Flyers. Darryl Edestrand – 1st pro goal. Goalie Bobby Perreault racked up the shutout as Rochester Americans tipped the Baltimore Clippers 3-0 in AHL play. Rochester defenseman Daryl Edestrand, 20, scored his first professional goal for the Amerks. Vancouver downed Seattle Totems 5-2 in a WHL game. 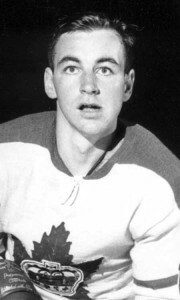 Billy McNeill added to his league-leading point total with a goal for the Canucks. Providence Reds became the first AHL team to defeat the WHL Victoria Maple Leafs with a 4-3 overtime decision. Bob Kabel scored twice for the Reds. Willie Marshall scored the winner after only 18 seconds of overtime. Portland downed San Francisco 5-4 in the other WHL game. Bill Saunders scored the winner with just over a minute to play.